It’s a word that continues to swarm around my brain in everything I do. It involves so much of what I create; from group tours for widows and widowers and building the community that helps each person to feel welcomed to my business educating businesses about sustainability in their food services and building sustainable communities around these transitions. Throughout this weekend I saw community in everything around me. Online communities have grown exponentially and provided amazing bridges for people to connect in ways they may not have in the offline world. Yet online relationships have become strained over the past few years especially relating to the political divide in the United States. I have felt it between my own friends and especially my family. Yet this weekend, Dave and I went camping with several families from my father’s side of the family. We all have very different opinions when it comes to politics and religion. But for a weekend, none of that mattered. We were glad to be in one another’s company. We shared in the downpour of rain and storms that surprised us on our first night at the campground, we enjoyed food and fellowship on a wonderfully cool August today with many grandchildren and my 92 year old grandmother, we shared in the beauty of a near-full moon, and exchanged reluctant goodbyes on Sunday not wanting to part company or the quiet of the campground. It was wonderful to be in each other’s company and to find commonality and compromise that we so often fail to find in the online world. When Dave and I returned home we went to an Asian food festival at a local Vietnamese church. We found ourselves with other white folks enjoying our mutual love of Asian cuisine. We sat with others and shared our stories – complete strangers offered prayers for an upcoming surgery Dave’s father is about to undergo. In food we found community. Afterwards, we went to visit his parents and to take some of Dave’s dad’s favorite Pho soup to them. We wanted to spend time with his father who is about to undergo a heart ablation on Tuesday. The situation is tense, surrounded by stress and worry. Dave lost his Godmother to the same procedure and everyone is just waiting for Tuesday to come and go so that his Dad can recuperate and hopefully regain energy and rid his heart of these disturbing A-fib attacks. My mother also anxiously awaits for Tuesday to come to find out whether or not her cast can be removed for good and she can begin recuperation before my parents’ dream trip to Europe in September. 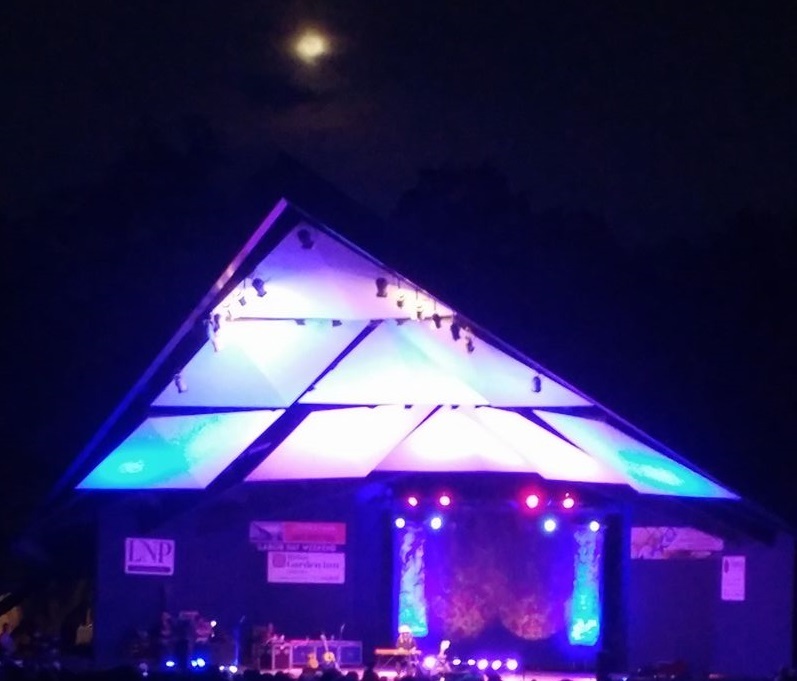 That evening we finished our weekend off surrounded by an even larger community who gathered at our local amphitheater for the free Arlo Guthrie concert which was opened by his daughter Sarah Lee who played there several years earlier with her husband. It was already packed when we arrived in spite of us getting there 45 minutes early. We were fortunate that a great parking spot opened up as we passed two parking lots that were filled to capacity. We parked and made our way through the crowds while occasionally stopping to say hi to friends. We plopped our chairs down and found out we were surrounded by more friends we knew from all points of life. At the end of the opening set Sarah Lee shared that she had visited the chapel in the corn field that was built to protect the land threatened by the Atlantic Sunrise pipeline here in Lancaster county, PA. She sang a song from her father’s and added a new verse dedicated to Lancaster Against Pipelines. A quarter of the crowd stood up and cheered and I felt such strength and pride in the water protectors among us. Her father came on stage and led us in music as we bobbed our heads up and down and laughed heartily at his storytelling. He ended the night singing ‘This Land is Your Land’ and I felt tears come to my eyes, not for the first time that night. We were among thousands of other people-some hippies at heart, some boomers who voted for Trump and cheered Mexicans being deported, some families with kids and dogs enjoying an unusually cool August evening, some tokers who came to enjoy Guthrie and a flashback to the 60s, and all kinds of folks. But for that one evening, we were a community enjoying a beatnik legend together. I found myself without internet most of the weekend, tucked away in the protected forests of a state park in Pennsylvania and in disconnecting I found myself connected to family, community, and nature. Sometimes disconnecting is the best way to bridge the divide to find community.